Sure, it's a whole 'nother day away, but Winter Is Coming where I live and I may be in a state of hibernation by the time the Academy Awards roll around — though hopefully we won't get a lot of ice and lose power. 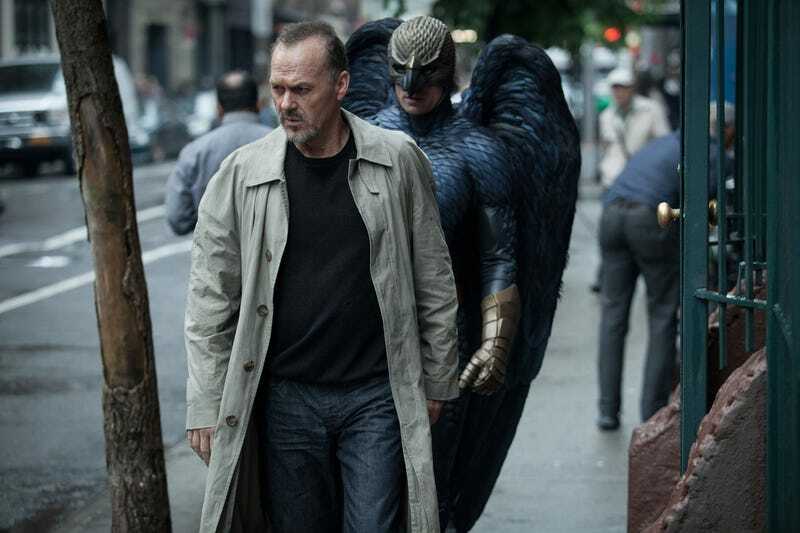 Just as an informal, uninformed guess, I really think Birdman will win Best Picture. It seems like kind of a long shot, compared to the other, more traditional nominees, but the movie speaks to a lot of Academy voters' anxieties about the future of movies, stardom, and the film industry in general. It used to be that Hollywood movies were based around a strong personality — usually an actor or a director. Now they're based around brands or franchises. The typical moviegoer in 1939 who enjoyed Clark Gable and Vivien Leigh in Gone With The Wind didn't come out of the theater thinking "Man, I can't wait for Gone With The Wind 2!" but "Hey, I really liked those actors, I'd see other movies if they were in them." Nowadays it feels like the star is just an part of the franchise machinery — Shia LaBeouf was the "star" of Transformers 1-3, but hardly anyone noticed when the fourth movie replaced him with Mark Wahlberg. And Wahlberg is a much more dynamic screen presence than LaBeouf, sure, but if he were replaced by, say, Bradley Cooper or James Franco in Transformers 5, it's likely nobody would complain. This is a really scary notion for the film industry. Sure, action franchises have been around for decades, but they tended to act as a springboard for bigger and better things — look at Harrison Ford or Sean Connery. Increasingly, though, leading men and women seem disposable and interchangeable. Sure, some roles seem indelibly tied to a specific star, but for every Robert Downey Jr. as Tony Stark, there are a dozen Taylor Kitsches as John Carter or Battleshipman. And this is where Birdman comes in. Lots of film critics cite 1989's Batman as a turning point in the history of modern movies, when the franchise or brand became more important than the star. Michael Keaton was one of the great comedic actors of his generation, but he became best known for playing a character whose face was 80% covered by an immobile rubber mask for most of his time onscreen. And when he quit the role, he didn't remain a Batman-sized superstar — though admittedly a lot of that might have had to do with the crummy movies he appeared in afterwards, like My Life, Multiplicity, and Jack Frost. In the meantime, 1995's Batman Forever, starring Val Kilmer as the Caped Crusader, actually made more money than 1992's Batman Returns. So I think a lot of Academy voters, especially the older ones — and they're mostly older ones — look at Keaton/Thomson as a cautionary tale about the Faustian nature of movie franchises, especially those based on comic books. For a lot of filmmakers and performers over 50, it wasn't too long ago that "comic book movie" was a slur, and not an accurate descriptor of the movie industry's most successful product category. Hollywood loves billion-dollar worldwide hits, but it clearly is anxious about what brand- and franchise-based movie universes actually mean for the future of the medium, especially where new technologies like streaming and smartphones/tablets come in. That, coupled with a persistent middlebrow ambivalence about genre films (remember that Iñárritu has referred to superhero movies as "cultural genocide"), leads me to suspect that Birdman is a very deep and accurate reflection of those anxieties, to the point where I could see them giving the award to the movie over more obvious/prestigious choices like Selma, American Sniper, Grand Budapest Hotel, or Boyhood.